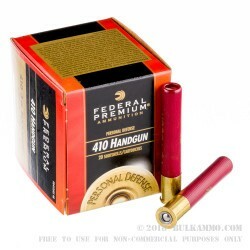 This 410 Bore shell by Federal is loaded with nine pellets of #4 buckshot. Optimized for personal protection, this shell offers excellent patterns for home defense, high-energy delivery with a muzzle velocity of 950 fps, and a customized hull design and special brass head to ensure smooth extraction. 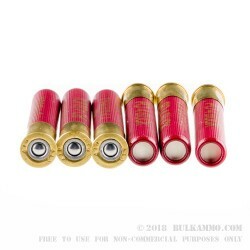 It’s a great load for a “pocket shotgun” such as the Taurus Judge, Smith & Wesson Governor, or Magnum Research BFR, or even just your regular shotgun if you prefer it for home defense. Nine well-placed .24” lead balls traveling at that speed ought to be more than enough to take down any human-sized intrusion in no time. 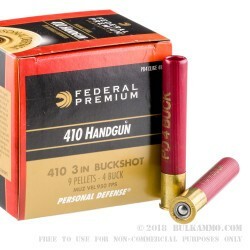 Federal Ammunition has developed a staggering number of specialized ammunition varieties since their foundation in 1922. They’re able to do so out of the strong corporate culture of innovation that they have always cherished, as well as their thorough commitment to quality control.